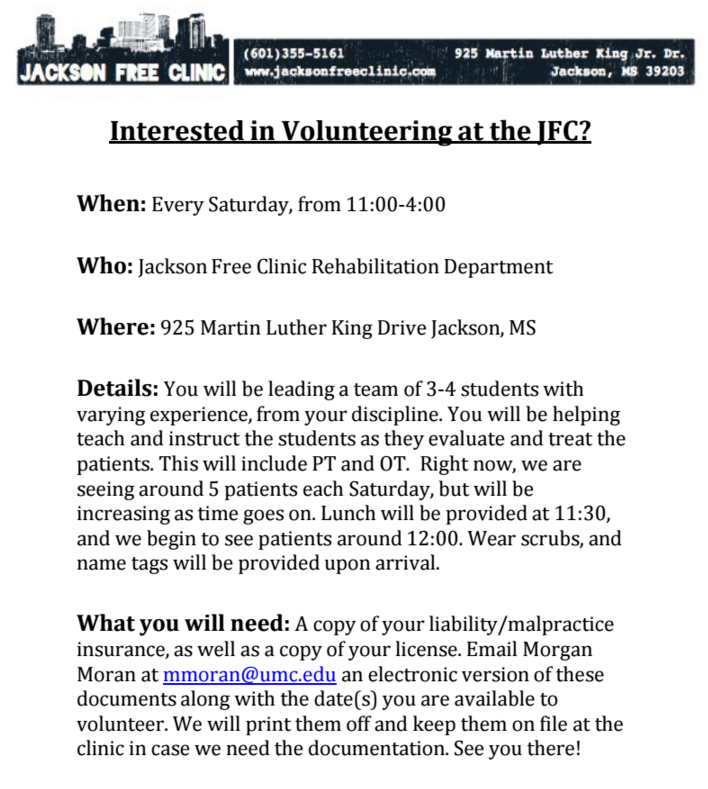 The UMMC OT student volunteers with Jackson Free Clinic invite OT clinicians in our community to volunteer to oversee the treatments provided by the students, share your expertise and answer any questions that the students may have. Typically, 4 OT students and 4 PT students staff the clinic each Saturday, treating 5-10 patients. The students work on teams and are supervised by the volunteer clinicians. Lunch is provided each Saturday around 11:30, and we begin treating patients at 12. We usually wrap up before 4pm. Any licensed clinician working at the free clinic is covered under the school’s policy. Print the flyer to share with your colleagues! Contact OT Student Candace Page-White, OT2 for further information/questions: [email protected].